This all came about because of a large multi-colored stack of stripey tees I have had taking up space in my workshop for months. The t-shirts were all thrifted and reclaimed and salvaged from our own outgrown boxes of clothing, of course. When I started collecting them, I admit, I had no idea what I intended to do with them. But those colorful stripey tees kept calling my name every ime I went to the thrift store...even Mr Beeper commented when folding a freshly washed pile how lovely they were to look at. Yep. 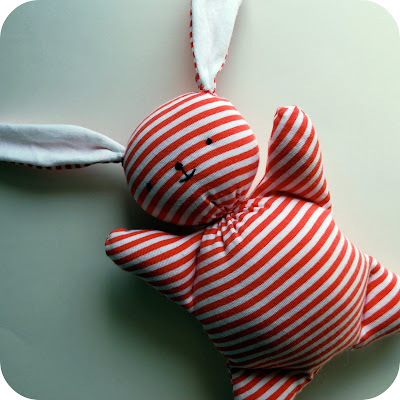 And so here we are, a little Mooshy Belly Bunny tutorial and pattern download for you so you can cut into some of your own discarded stripey tees and get something simple and sweet back from it. And this is an easy plushie to make--you can turn this out in about 1 hour. For real ( I made three, I would know). So, for those of you who have left comments stating that you do sew but want to sew more, and more specifically, want to sew plushies but are a little intimidated to try--well, this tutorial is dedicated to you. Yes, you. And you know who you are. Anyone can make this little guy, and even with a screw up or two, it will still look sweet and be mooshy and stuff. And need I also point out that this is the prefect last-minute bunny to make for someone's easter basket? You could easily do it tonight. So, go root through your boxes of discarded clothes, dig through the bowels of your kids'closets, find some stripey tees and go to it. Because I know you can make this one. And I know the results will be just fine. Just relax, drink a glass of wine (or two) if you have to, and try to enjoy this. It's just a little bunny. Easy peasy, people. Thank you!!! it's a funny bunny!! its gorgeous - think I'm going to try this one! How adorable! I think I'm going to pull out my own striped shirts and get to work right now! Love it, but I can't open the link!! Regarding the link--I was having some problems with Google Groups last night--but the link is not broken--I just opened it. Try back if you cannot open it right now--something is going on with Google Groups that is making it temperamental right now. And thank you for all the lovely comments. Too cute! You have such great ideas. I will have to make a few. Link trouble like the rest :(. Super cute! Love the idea of recycling tired tees! Thank you! I think this will be a great way to reuse cute baby clothes. Cna anyone tell me if they have been succsseful at all in accessing the pdf download? Just either email me and let me know or leave a comment here...just curious. Like I said, I have been able to acceess it today, but last night it was not working...damn Google. Thank you so much for this, I managed to access the PDF yesterday but only after many attempts. Thank you for the tutorial! I will be trying this one for sure! I love it! thank you for the tutorial... that bunny is cute and nice! I like all kinds of recycled crafts. This bunny is so sweet, thanks for sharing. I am going to share it with my friend at my blog with your link. This is so cute! I love it! This would be well loved at my house! I will have to download. Because I am not an intrepid crafter or sewer these days. What will pain is cutting up stripey shirts. I Heart Stripey Shirts. I heart stripey shirts too--that is why I have the stack of them in the first place. Also, Carrie, I made one of these bunnies for Matilda and will be delivering it to your home tomorrow...but this might be a good first project for Matilda to try to make with you, given her interest in sewing. wow. now that is cute! Thank you for this adorable patter. I made one for my little boy, and one for another friend's little boy. Your blog is always so useful! Thks, I can open it now, going to try this weekend! thanks for the tutorial, he's so sweet. Um, this is darling. Way way darling. My son and I made one last weekend, but he insisted on turning it into a cat! I still hope to try the bunnies, too. This mooshy bunny is too sweet! I made one yesterday for a friend I will see at the weekend - she's just had a baby and it seemed the perfect gift. One question on the darling little pom pom tail though - my husband immediately showed concern that it was not baby-safe. I'm wondering if I should take it back off again? I think at 5 weeks, it's safe enough, but when baby gets to the oral phase where he puts everything in his mouth...would the tail be a choking hazard? Thanks for the fabulously adorable tutorial!! I can't WAIT to try this out. I am going to a baby shower next weekend and guess what the baby girl is getting? Thanks! All the mooshy belly bunnies you guy have been making--why, they are proliferating like, well, rabbits. Just found this through some blog linkage -- it is ADORABLE! I've saved the tutorial already for next Easter. I just made one from a favourite tshirt. I love that the pom pom tail allows him to stand upright! I whipped up one of these a few weeks ago and posted it on my blog! Thanks for this tutorial..I have had you bookmarked for a while and thought it was the perfect thing for my one year niece. Adore this bunny! Taking this project on tomorrow since my husband will be out of town for the weekend! Too cute! Oh, this is very adorable!! I have a polka dotted tee that I have wondered what to do with it... and now I know. Yay. Thanks for the awesome tutorial! Finished my bunny! This is adorable!!! Thank you. Love this!! I just made one for a baby shower gift "from" my daughter - I used a pair of her old pants. I had a little trouble sewing the curves (I'm a sewing machine rookie, really), but you're right, the imperfections make him all the cuter!! 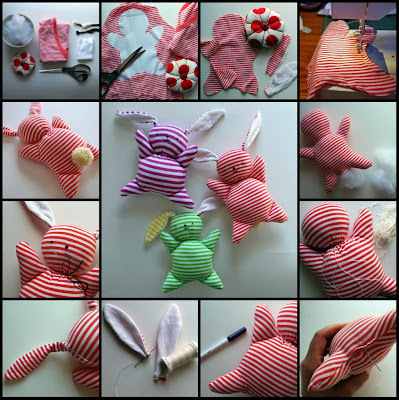 http://inmommyland.blogspot.com/2012/01/bunny-cuteness.html - Thanks for the tutorial! That was fun! Such a lovely bunny :-) I'm looking forward to make one. Since I'm not a sewer, what are the notches between the head and the arms for? Thank you. The notches stop it from bunching and gathering in these areas when you turn it right side out--it allows the seam to lay smoother. I've already made 3 rabbits for 3 little kids. I've had only congratulations. Wow this is really cute and it looks so easy to make. I'm thinking of making one for a friend who just had a baby but I am a bit worried that the string around the bunnies neck might not be save for a newborn. I'm thinking it might come off and the baby could swallow it or get entangled in it. What do you think? I am pretty sensitive to what coulée conceivably be pulled off by a baby--especially since when my boy was a baby he chewed and pulled ferociously on everything he could reach--but I really think you are safe with these--for one, the string is pretty much completely obscured by the bunny's head and body so it is not noticeable and not especially esy to get to, but you can also tie the string around the neck in a couple of loops, using knots with each new loop, making it practically impossible to come loose. Once cinched the string will be too small to slip over the bunny's head. So, I would not worry about the string. Just made one of these bunnies. Its turned out fab! Think I may have to make another! I just churned out a slew of these for Easter baskets - perfect size, easy and adorable. I didn't have scrap knits so I used a woven calico. Thanks for the tutorial, I'm new to sewing and this was a perfect project! Thanks for this great tutorial! Here's a link to the bunny I made. Cheers!! Thank you .... I love it! Hi there, I loved your tutorial so much! I've made my own bunny (I very conveniently had an old stripey t-shirt lying around begging to be made into a bunny). Your site is very good and helpful thank you. Thanks a lot for that bunny. Thanks a lot for this bunny. I loved making this bunny...and my daughter loves it even more! I'm planning on making a whole batch of these to give out as gifts...unfortunately I only have black and white stripey tees...I envy you for the beautiful bunnies you made in so many different colours! Thanks for the wonderful tutorial. I don't sew a whole lot...what are the notches for? I don't see where I ever come back to that. Amelia, the notches are cut in places where the bunny's body has curves-- it helps the seams and curves to not bunch up and curve more smoothly. The notches are not meant to be sewn--you just cut them in and leave them be. How do i trim a notch? HELP! How do you trim a notch? In detail, please!! Parisa, you simply cut a tiny "V" into the deep curve between where the body and head come together--you will see a tiny v indicated on the pattern template where you should do this. You just need to take care to not trim into the seam you sewed--so your "V" should only be cut into the inseam portion of the fabric. The notch you cut will allow the curve to turn out more smoothly once you turn your bunny right side out--otherwise it will pucker a bit (if you feel too uncertain about doing this still, skip it and your bunny will still be fine...the seam will just pucker a bit in that neck area, but because you tie this area up with a string later on after you stuff it, it will hardly be noticeable). Hope that helps! Thank you for the tutorial! I hope I can make a cute bunny tomorrow! Does the template include seam allowance? Anne, the pattern template does include seam allowance. Happy bunny making! Hello! Thank you for sharing this nice tutorial! I'm new at sewing and wondering if anyone can help me - I can't seem to figure out how to embroider the face on while the bunny is already stuffed, from the outside. Can anyone point me in the direction of a link that might help me out? This is too cute! Have made 2 in the hour one each for both my grandsons. Feel there maybe a few more to make when other people se them lol!. They are so cute,and now they've got many french cousins!Thank yo so much for taht fantastic idea! Love love LOVE this tutorial! Have you considered selling the licensed pattern at all? I ask because we run a sewing club, and it's just the sort of simple project we'd like to teach a class on one week. I know our members would love to make one, as so many of them have kids! Also, I have hundreds of baby gros I'm looking to use up somehow, and would end up with too many to do anything with but sell on! Thank you for such a wonderful simple but delightful toy pattern. I keep visiting your blog to see if you come up with anything else. I have made several for my grandchildren and they are much treasured. Hi, this bunny is so lovely and cute. I wanna make one for my baby cousin, but I have two questions; 1.) I'm not a pro at sewing. I just 'can', but I'm not great at it at all. Do you think it'll be simple enough for me? 2.) I... Have no experience whatsoever with the sewing machine. What if I sewed it simply with a needle and thread? Would that work? Julia, this is a pretty simple beginner project. And yes, you could hand sew this, just use little stitches. I believe in you--you can do it. I'm so looking forward to making more of these. I have so many scraps of knit leftover that need to be made into bunnies! Just made one by hand, turned out so cute. Thank you! Thank ou very much for this nice litte bunny-pattern. I will sew it for my twin-boys I´m expecting in June! Just saw this on Sew, Mama, Sew, and it is beyond adorable. I also have scraps of jersey just waiting to be something... this bunny is it! Thanks for sharing the pattern! Thanks for this funny bunny tutorial! I made it from flannel, but it works! Just saw this on Pinterest (how many times have you heard that?! lol) This is so adorable! I don't sew much, but you've made this seem pretty easy, so I'm going to try to make a bunny family for my niece. Thank you so much for sharing! I LOVE this bunny and would love to make some for Christmas presents, but I cannot get the link to work. I have tried from a couple of different computers too. Is it possible for you to email me a copy of the pattern, or another link? Thank you and I cannot wait to look through your blog and see what other goodies you have! I am so glad I stumbled upon it!! I'm just wondering if you could email me this pattern? I can't get it open, I've tried a few computer and on different days with no luck. Thank you in advance and I love this bunny! I can't wait to make some presents with it! 145This tutorial is great. I hope that my stitch group will help me make some of these for charity Christmas presents. Bless you.